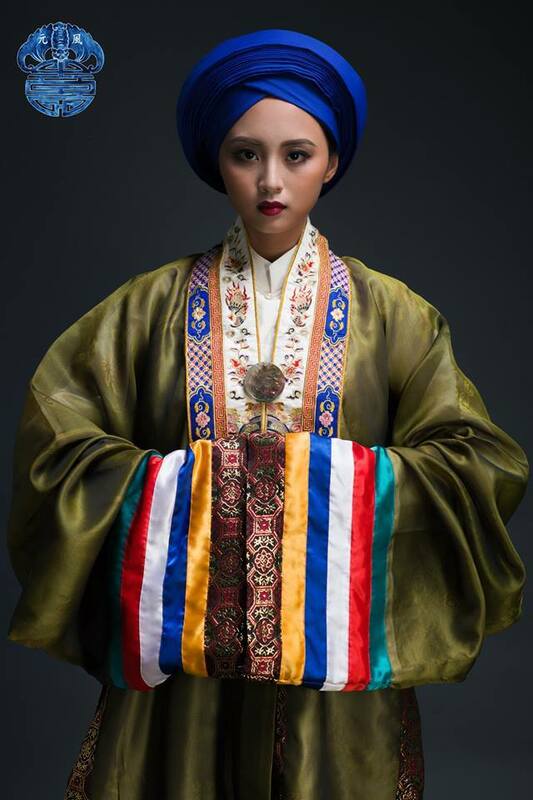 The traditional costumes of a country tell many stories about its history and culture. Vietnamese costumes have been affected by many cultures in the world from the past to present, making them more beautiful and educational. If you’re looking for a little information on these costumes and where to find them, keep reading. When talking about Vietnamese traditional costumes, many of you will just be familiar with the ao dai. 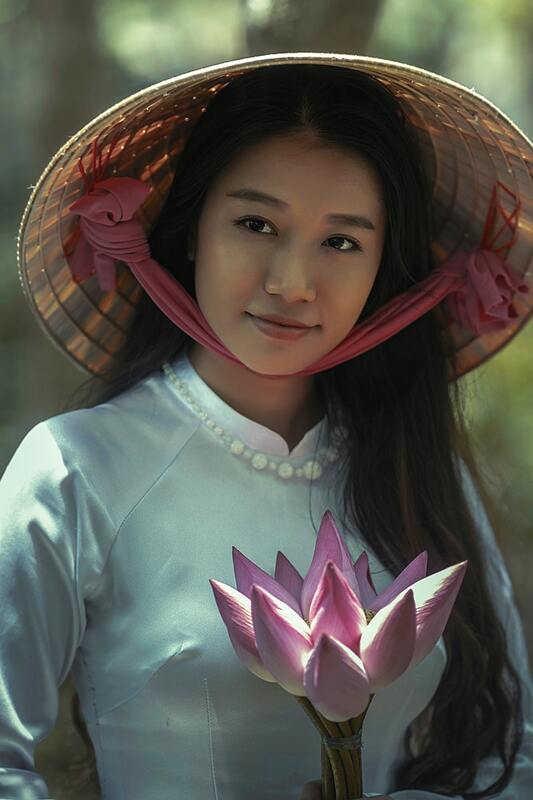 However, in addition to the ao dai, our country has many other incredible traditional costumes such as ao tu than, ao Nhat Binh, ao tac, and ao ba ba. 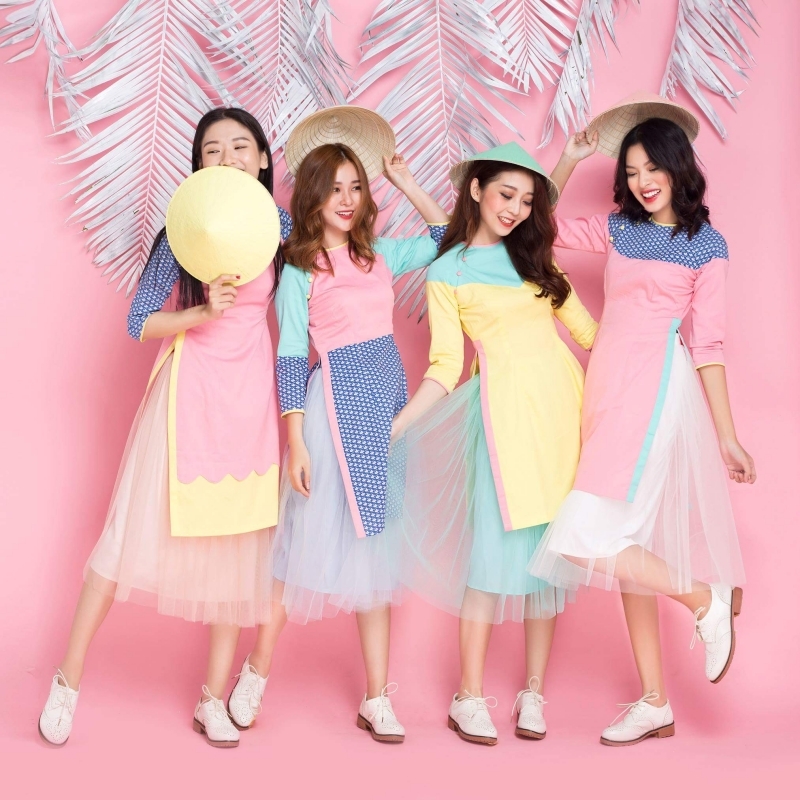 There is no doubt that the ao dai is very well-known in Vietnam and the world, but today I am going to introduce to you more about our traditional clothes. But let’s start with the ao dai. This is the most popular traditional costume of Vietnam. 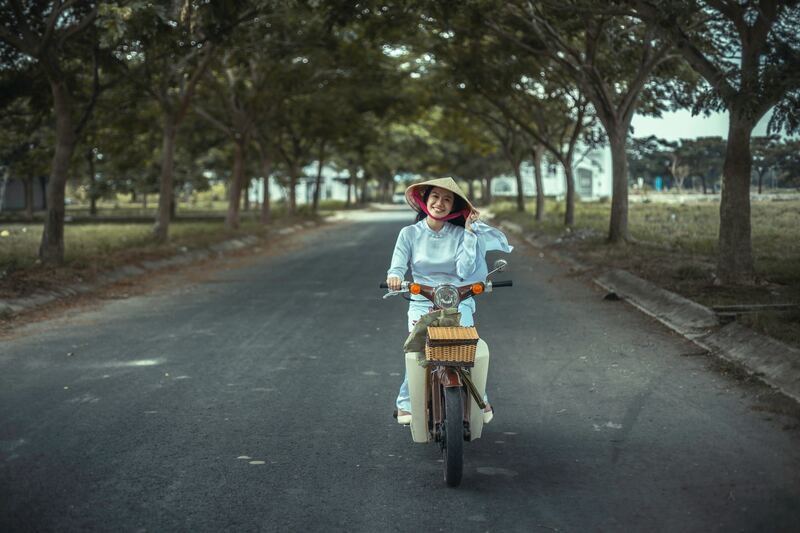 Nowadays, the ao dai is preferred by women more than men and you can encounter Vietnamese women in the ao dai in every corner of our country. Ao dai, literally means long dress, it has long trousers and a two-flap dress with different colors and patterns. A truly elegant piece of clothing, it gives me pride to see someone dressed this way on the street. The history of the ao dai dates back to the second half of the 18th century, to 1774. At this time, there was a civil war within Vietnam: The North was ruled by the Trinh family and the South was ruled by the Nguyen family. In the south, the first Lord Nguyen Phuc Khoat recognized that our costumes were very similar to those worn by the Chinese and with an ambition to be a king of an independent land, he ordered his people to change the way they dressed. According to the decree, for casual clothes, men and women had to wear gowns with straight collars and short sleeves, small or wide sleeves were optional. The gown has two seams on either side. It allowed men to wear gowns with a round collar and small sleeves when working for more comfort. This marks the first generation of the ao dai with five flaps called than. The two flaps in the front and two flaps in the back were the four main thans and represented tu than phu mau, which represents the birth parents and parents-in-law. The last than was designed inside the front flaps, representing the wearer. In a word, this five than design means the four parents always protect their child. There were five buttons on this gown, representing ngu thuong, which represent the five cardinal virtues of Confucianism: humanness, righteousness, proper rite, knowledge, and integrity. The decree of Lord Nguyen Phuc Khoat in 1774 marked an important innovation in Vietnamese clothes, which ultimately characterized our traditional costumes. 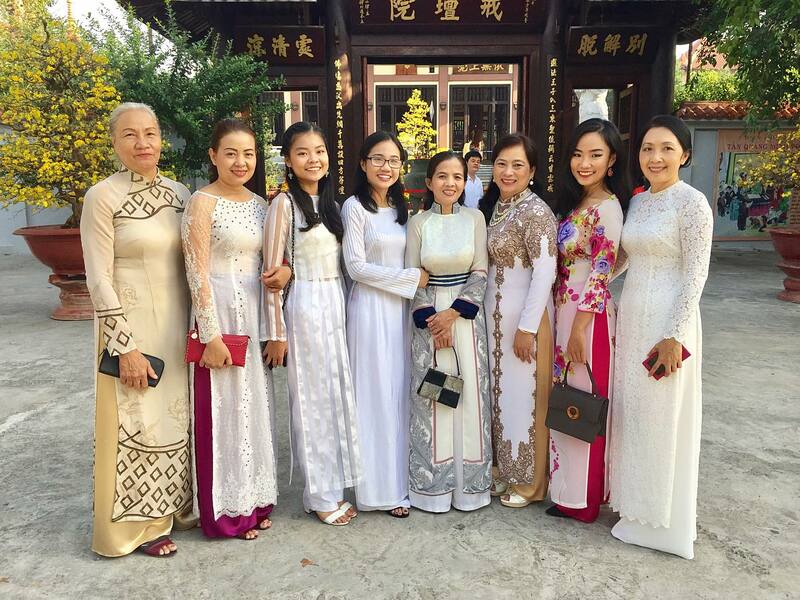 After Nguyen Phuc Anh reunified the territory of Vietnam in 1802, which was the beginning of the Nguyen Dynasty, the ao dai became the national clothing of this dynasty. Since the 19th century, the two front flaps were sewn into one flap, and the two back flaps were sewn into a singular back flap. The fifth flap still remained (now the third than) behind the front flap. The ao dai became a long dress with two slits on both sides, very similar to the modern ao dai. Later, the fifth flap was eliminated, the modern ao dai appears with only two flaps, front and back. The specialty of the ao dai is that it is a tight-fitting dress which magnifies the beautiful curves of a woman’s body. The slits on both sides up to the waist create a charming and unique cut that is classically flattering. 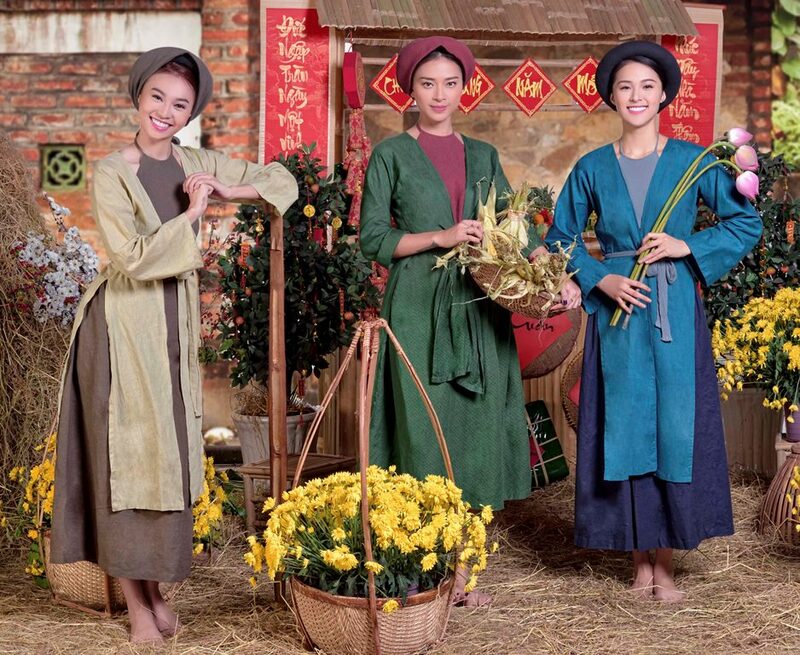 Today, designers have created many new styles of ao dai, diversifying this costume. Modern Vietnamese women usually wear the ao dai for special occasions such as Tet (Vietnamese New Year), weddings, festivals, and ceremonies. 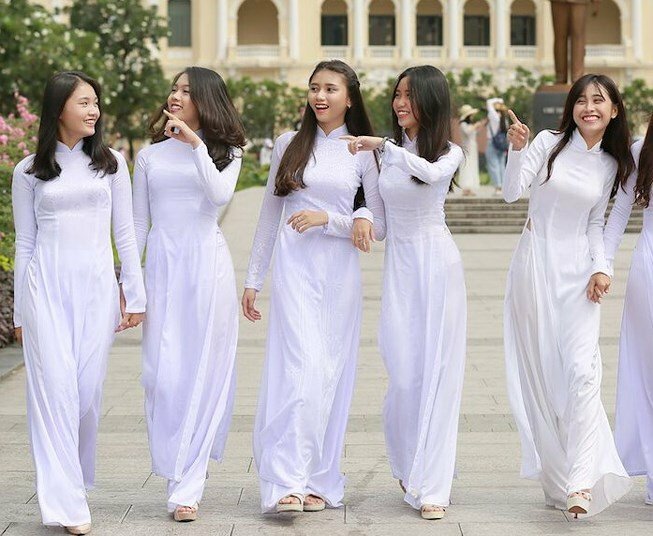 In public high schools, schoolgirls have to wear the white ao dai twice a week, on Monday and on an optional weekday. High school female teachers also have to wear the ao dai when they are in class, but they can choose the color and style. Thanks to the innovative ao dai, women can now wear this fit when they want: to work, for a walk, to go on a date, and even traveling. For men, since the era of Lord Nguyen, these clothing rules are not as strict. Later, the gown for men became more comfortable and convenient. Nowadays, men occasionally wear it for special events but it’s less popular than for women. Men’s ao dai, of course, is not as tight as the women’s. Where can you buy or rent the ao dai? No one knows exactly when ao tu than appeared, but archeologists found the image of ao tu than sculpted on the surface of trong dong, a kind of copper drum, thousands of years ago. Ao tu than has four long flaps, two in the front and two in the back, also called than. The meaning of these thans is like the four main flaps of the first generation of ao dai, they represent the birth parents and parents-in-law. In addition, the ao tu than doesn’t have the fifth inside flap or buttons. Ao tu than is sewn by connecting four pieces of garment (the same or different colors) but the ends remain split. Wearers first put on a bodice called yem, then a thin shirt. Women tie their waist with a silk sash. The ao tu than is worn as the outermost layer. Because it doesn’t have any buttons, wearers tie a knot using the two front flaps around their middler you can let these pieces of fabric dangle for a looser fit. A long black skirt is worn beneath the ao tu than and it almost touches the floor. Non quai thao, which is a large flat palm hat, is a popular accessory of ao tu than. In the past, ao tu than was dyed with natural colors, like the dye-yam, tropical-almond leaves, or mud. Now, ao tu than is dyed with many bright colors, making it more beautiful. Ao tu than in the past was worn as casual clothing by the northern women. In the present time, our northern women still wear it but just on occasion like when performing quan ho, a Vietnamese folk music style. Where can you buy or rent the ao tu than? 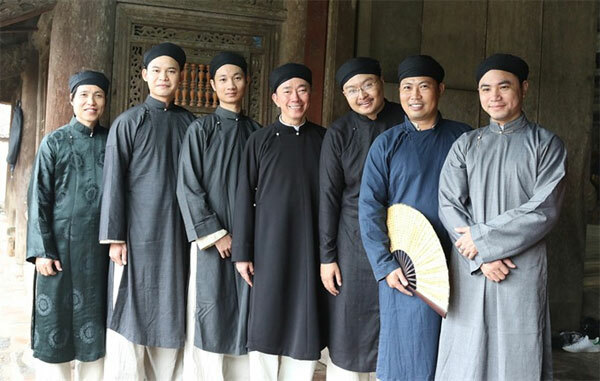 Ao Nhat Binh literally means square-collared garb. This was one of the casual clothes of the empress dowager, empress consort, and princesses in the imperial city of the Nguyen Dynasty – the last dynasty of Vietnam. When there were informal events, these royal women would wear the ao Nhat Binh instead of the Phuong bao (means the garb of phoenix), which was the noblest clothes of the empresses and princesses. For consorts, female officials and those ladies with high social status, ao Nhat Binh was their noblest clothes. Ao Nhat Binh is a straight-collared garb, whose collar dangles down, making two parallel lines. The origin of ao Nhat Binh was from Phi Phong garb, which was popular in the Ming Dynasty of China. When wearing ao Nhat Binh, wearers tie a knot with the pieces hanging from the collar in front of the chest and decorate (to hide the knot) with a sculpted gem. On the collar are flowers and phoenix patterns. The garb may be plain with one color or can be embroidered with many circular patterns. On the cuffs, there are five colored lines which are green, yellow, blue, white, and red representing the Five Elements wood, earth, water, metal, and fire. According to the Nguyen Dynasty decree, the compulsory color of ao Nhat Binh for the empress was pure yellow, sometimes orange. For the princess, it was pure red. Peach, pure violet, and light violet were the colors for the consorts. For lower status women, there were no required colors. A turban and long white silk trousers were dressed together with ao Nhat Binh. After the collapse of Nguyen Dynasty in 1945, ao Nhat Binh became a formal garb of upper and middle class to wear in important ceremonies, especially in a wedding. 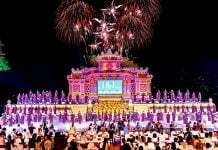 Currently, young Vietnamese are trying to revive the ao Nhat Binh and bring back the culture of the Nguyen Dynasty. You may want to visit the Facebook page Little For to get more information about new styles of ao Nhat Binh. If I had to choose the most stunning traditional costume of Vietnam, I will vote for ao Nhat Binh instead of the most popular ao dai. Where can you buy the ao Nhat Binh? 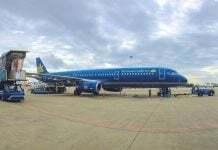 Contact the Facebook page Little For above to order the ao Nhat Binh, or Y Van Hien Company, whose business is to retrieve Vietnamese ancient traditions and cultures. To make it simple, ao tac is a variant of the ao dai, but it has loose and large sleeves. 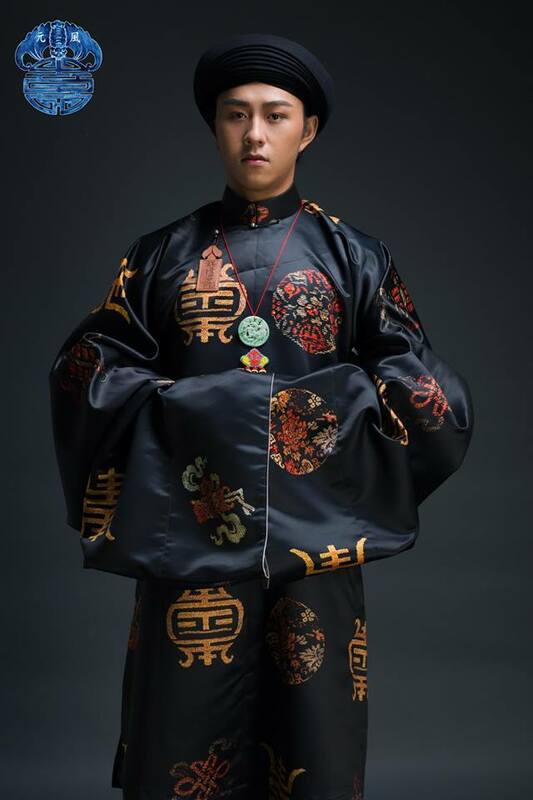 This is considered the national costume of the Nguyen Dynasty, because ao tac can be worn by any class in society, from the royal, the officials, to the middle and lower class, and can be worn by both men and women. Ao tac was worn in important ceremonies and occasions such as a wedding, funeral, Tet, and worship events. You can wear any color you want, but it should be based on the occasion. When wearing an ao tac, your two arms ought to be folded in front of the stomach because the sleeves are long and baggy. This action is to hide both hands and show the humbleness, respect, and elegance in crucial events. Like the ao dai, the ao tac has a standing and circular collar and is a form of the five-flap gown. It can be plain or decorated by woven patters. An ao dai or five-flap gown with a high collar was worn beneath the ao tac. The reason is in the past, the ao tac was a deluxe costume and only worn for important events, the first layer of clothes was worn to protect the ao tac. Usually, men wore a white gown against their skin while women could wear any color they wanted. This attire can also go with a wrapped turban. Nowadays, Vietnamese still wear ao tac in such occasions as weddings, funerals, and ancestor worship. The ao tac is also one of the costumes being reimagined in new styles and can be worn whenever we want, not only on special occasions like before. Some of our pictures about ao Nhat Binh and ao tac are taken in the permission of the Facebook page Nguyen Phong Doan Linh, which provides a lot of information about Vietnamese traditional costumes, especially in the Nguyen Dynasty. You can visit this page to learn more about our costumes, they also have English descriptions. Where can you buy the ao tac? Little For, in addition to ao Nhat Binh, also provides new styles of ao tac, so you can buy it by contacting the page. It is important to realize that this name is actually áo bà ba. There is a small difference in the tone of the words ba. Ao ba ba literally means the shirt of madam Ba. There are many assumptions about the origin of ao ba ba, but now I would like to tell you an interesting story. Once upon a time, everyone in this country had to wear long gowns. There was a fisherman who was very poor but had to wear the gown like the others. Day by day, the gown accumulated tears but he didn’t have enough money to buy a new one. The gown became shorter and shorter, and it had many holes which made it look like a turtle’s shell. “Don’t be afraid, you are not guilty! A few moments ago, I thought you were a ba ba (with no tone, it means turtle in Vietnamese). It turns out you are a man in a ba ba shirt”. Then, the king gifted him gold and cloth. The fisherman happily said thank you to the king. He was no longer poor but still kept the ba ba shirt. Afterwards, many poor people followed the style of the ba ba shirt because it didn’t require too much cloth and was easy for them to work in. This shirt was called ao ba ba. The women realized that ao ba ba was also suitable for them, so they started to wear it. The men saw that and said the women were wearing ao bà ba, which meant the shirt of madam Ba. Gradually, the original name ao ba ba was forgotten and áo bà ba subsumed its place. It is a simple short shirt with long sleeves and buttons from the neck down to the belly. Áo bà ba is always paired with long silk trousers. The colors of this set depend on the combination and the desire of the wearers. 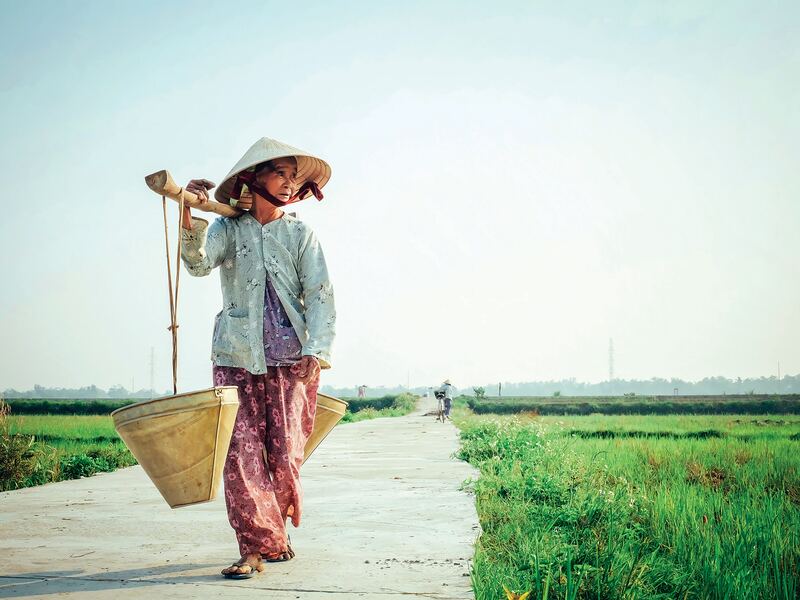 Áo bà ba is a popular costume in the Vietnamese countryside, especially southwestern Vietnam. You can see most of the southwestern people wearing this shirt during many activities. 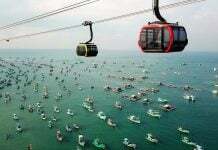 Where can you buy or rent the ao ba ba? 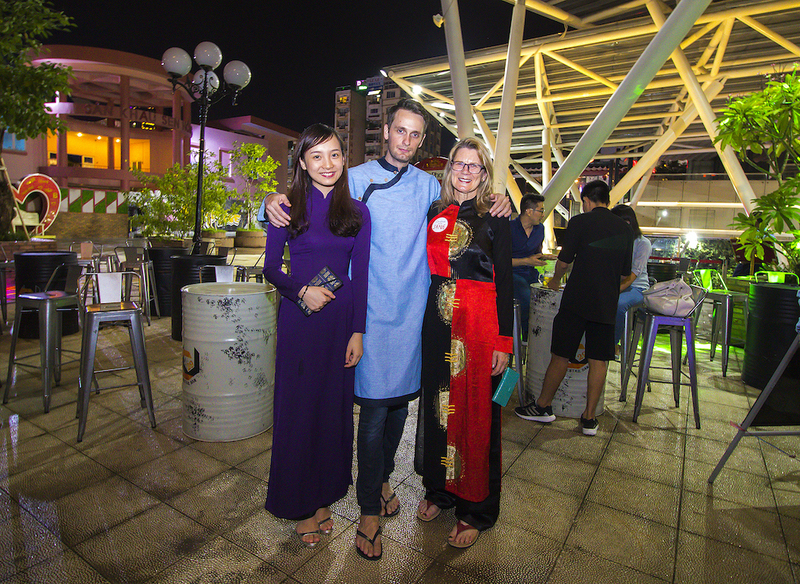 I hope that my article gives you a broad view of Vietnamese traditional costumes. How about going to Vietnam and dressing in these wonderful clothes?